Great Smoky Mountains National Park is an area of scenic forests that holds a world record number of 130 tree species. Fourteen major forest types are distinguished, most notable cove hardwood and spruce-fir. 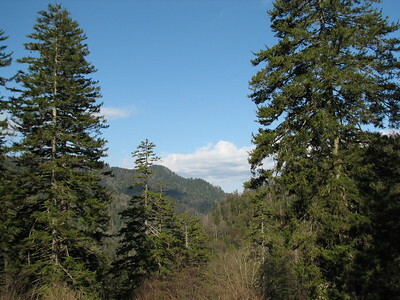 Large parts of the forests are old growth forest with many trees that predate European settlement of the area in the 18th century. The park covers 209,000 ha and has been a US National Park since 1934. It has diverse fauna including 50 native animals. These include the black bear and the white-tailed deer, and smaller mammals like the red fox, raccoons and squirrels. Its lungless salamanders, more than 200 species of birds and mollusks are also notable. There are a number of historical attractions inside the park. The most well-preserved of these is Cades Cove, a valley with a number of preserved historic buildings including log cabins, barns, and churches. These were made by the white frontierspeople that began settling the land in the 18th and early 19th century. Before that, the region was part of the homeland of the Cherokee Indians. I spent two days in the Smoky Mountains, a Monday and Tuesday in April, and was fortunate enough to avoid the notorious crowds. At the first day I did the Cades Coves loop. This takes you through a secluded valley deep in the park, with bright green pastures and historical wooden buildings. It's also known for its wildlife, but I didn't encounter more than wild turkeys (huge!) and deer. About half way on the loop lies the start of a popular walking tour, the Abrams Falls Trail. It's a 5-mile walk. It takes you on a sometimes slippery path through the forest, ending at a waterfall. Not wildly spectacular, but a fine way to stretch your legs. I walked it in about 3 hours in total. The second morning I took the Newfound Gap Road that leads right through the National Park, from Gatlinburg (Tennessee) to Cherokee (North Carolina). Along the road are a number of overlooks that give good views over the forests and the mountains. The latter indeed with the layers of "smoke" attached from which it takes its name. In the evening I undertook a last attempt at spotting a bear (or other wildlife). I went back to Cades Cove, where I arrived at 7.15 pm. The setting sun gave the open fields a wonderful golden glare. There were more cars around than during the day, many of those belonging to photographers. But again no bears! Only deer. The hosts of my B&B told me when I came back that (young) bears when they are hungry even come into Gatlinburg and spook around the house. At this time of the year they are not often seen. Cades Cove at dusk however still is the best bet. Great Smoky Mountains National Park was the first World Heritage Site I visited, part of a family vacation when I was six. I have fond memories of the trip and the blue-grey mist over the mountains, but much time has passed since then, so I decided to revisit the park in the summer of 2016 while on a road trip to Atlanta, Georgia. The park is a wonderful encapsulation of Appalachian culture, with small settlements and mills scattered throughout the forest. There are many other similar state and national parks throughout the Appalachian Mountains, but Great Smoky Mountains (and likely its family-oriented gateway towns) retains a mythos that continues to draw vacationers from all over the East Coast of the United States. During my visit, I toured an old farmstead off the Roaring Fork loop road and hiked up to scenic Grotto Falls, an easy and beautiful trail. I later traversed the park via Newfound Gap, which offered memorable viewpoints of the surrounding mountains. I also drove up to Clingman's Dome, the highest point in the park, to take in the views from the observation tower. The Great Smokies are definitely worth a visit (be sure to allow time for hikes), and, if one has extra time, I'd also recommend visiting some of the other parks in the Appalachian Mountains. Logistics: An automobile is necessary to travel to the many trailheads in the park, but from there the Great Smokies are a hiker's paradise. Our family spent 4 nights in a cabin in Gatlinburg, which is the Tennessee entrance into the park. Because we had little children with us, it was nice having our cabin so close to the town center. We took in Newfound Gap, which has a beautiful overlook and the site of the World Heritage Site plaque. Also worthwhile was Cades Cove. We were fortunate that even though we were there during the first week of June, summer vacation had not yet started for school children so it was not as crowded as it can be later in the season. We were also excited to see bears in the woods as well as in the meadow. The highlight was watching a black bear play with her three cubs. It was especially wonderful to share this moment with our 3-year-old daughter! The Smokies can be a joy or it can be a nightmare. in the summer. The traffic is overwhelming and very slow. or fall. The hiking in the Smokies is extraordinary. in July and didn't see a soul. It was marvelous. The Great Smoky Mountains have been designated as “one of the world’s finest examples of temperate hardwood deciduous forest”. For those interested, they also apparently have “possibly the greatest variety of salamanders in the world” and are “a centre of endemism for N American molluscs”!! I am afraid we didn’t look for any examples of these “families” on either of our visits and, I suspect, neither have many of the people who visit the Park each year. “Unique as its namesake Dolly Parton, Dollywood is a one-of-a-kind Smoky Mountain Family Adventure! Spanning 125 acres and nestled in the lush foothills of the Great Smoky Mountains in Pigeon Forge, Tennessee, near Gatlinburg, Dollywood is one of the most popular family vacation destinations”. And that is the problem with visiting the Smokies - wherever you go it is going to be very crowded. No doubt there are slack days but, in vacation season, it can be hell. The side trip along a loop road to the historic “log cabin” pioneer settlement of Cades Cove (Photo) can take hours to drive (it gets 2 million people a year). But it is a beautiful valley with lush pastures, dark green woods and rushing streams. Clingman’s Dome, at 6643ft the 2nd highest point in the eastern US, has an enormous car park and crowds walking the last half mile to the observation ramp (the Smokies are too far south to have a conventional “tree line” and, although there are some mountains called “Balds” topped by meadows most of the mountains are fully wooded - hence the ramp to get a view). No doubt it is possible to find quiet trails and to escape the crowds out of season but my visits have been in May/June when the area is popular for the Rhododendrons and both were pretty busy. By the way you can actually see the blue “haze” which gives the mountains their name – well I don’t think it was exhaust fumes anyway! Destroyed during invasion: Oconaluftee, the Cherokee capital within the park area was probably destroyed in 1776 by the army of General Griffith Rutherford during the American Revolution. Biological Corridor: Appalachian Trail Corridor "The Appalachian Trail’s protected corridor (a swath of land averaging about 1,000 feet in width) encompasses more than 250,000 acres, making it one of the largest units of the National Park System in the eastern United States. The corridor passes through some of the most significant and rare ecosystems remaining along the East Coast, and harbors more than 80 globally rare species. The protection of habitat within this corridor preserves connectivity between populations of not only rare species, but the hundreds of other species that persist only in this mountainous region." Visual effects of Cloud, Fog and Mist: Criterion (vii): The site is of exceptional natural beauty with scenic vistas of characteristic mist-shrouded (“smoky”) mountains, vast stretches of virgin timber, and clear running streams. Secret Locations: Some Cherokees hid in the park area escaping a forced deportation by American authorities. John D Rockefeller Jr: "The U.S. National Park Service wanted a park in the eastern United States, but did not have much money to establish one. Though Congress had authorized the park in 1926, there was no nucleus of federally owned land around which to build a park. John D Rockefeller Jr contributed $5 million, the U.S. government added $2 million, and private citizens from Tennessee and North Carolina pitched in to assemble the land for the park, piece by piece" (Wiki) A "Rockefeller Memorial" is situated at Newfound Gap. Late Pleistocene: Great Smoky Mountains National Park is of world importance as the outstanding example of of the diverse Arcto-Tertiary geoflora era, providing an indication of what the late Pleistocene flora looked like before recent human impacts (criteria i). It is large enough to be a significant example of continuing biological evolution of this natural system (criteria ii). 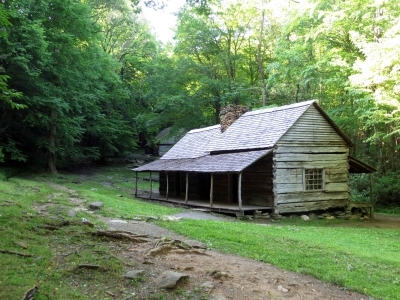 Located in a Former Capital: Oconaluftee, the former Cherokee Capital, located within the park. 188 Community Members have visited.